OBJECTIVES: The main objective of this study is to investigate the effect of bilateral arm training on upper extremity motor and functional recovery in stroke hemiparesis. METHODOLOGY: Twenty-eight patients with chronic stroke, attending the Department of Occupational Therapy, National Institute for the locomotor disabilities, Kolkata, West Bengal, India, participated in a single-blinded randomized pretest and posttest control group experimental study. Patients were randomized over two intervention groups; experimental group received bilateral arm training (n = 14) and the control group received an equally intensive conventional treatment program (n = 14). Each group received intensive training for 1 h/day, 5 days/week, and for 6 weeks. Pretreatment and posttreatment measurements were taken for upper extremity motor ability, functional ability, and functional use of the upper extremity using Fugl-Meyer Assessment of Physical performance (FMA-upper extremity section), Action Research Arm Test, and Motor Activity Log, respectively. 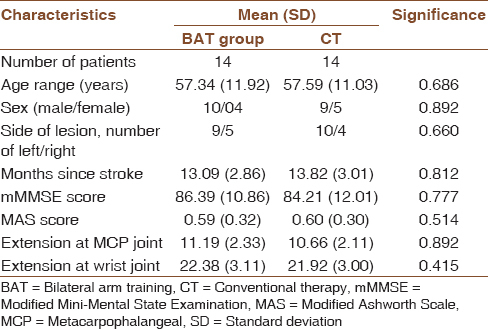 RESULTS: Bilateral arm training (P = 0.01) group showed statistically significant improvement in upper extremity functioning on Action Research Arm Test score in comparison to the conventional therapy group (P = 0.33). The bilateral arm training group also had greater improvements in FMA and Motor Activity Log score compared to conventional therapy group. CONCLUSION: Bilateral arm training can be used as a better treatment choice for improving upper extremity function in comparison to conventional therapy. Motor Activity Log (MAL): The MAL is a semi-structured interview, where the patient and their caregivers independently rate how much and how well the patient has used the affected arm for 30 activities of daily living in the past week. Patients and caregivers use a 6-point amount of use (AOU) scale to rate how much they are using their affected arm and 6-point scale to rate quality of use to rate how well the arm is being used. A higher score indicates better performance. The MAL has established good test–retest reliability, internal consistency, stability and responsiveness, and convergent validity. Transferring object from one container to another-10 min. Homogeneity of the subsets was tested for all the outcome measures used in the study. The characteristics of the patients are presented in [Table 1]. Baseline patient characteristics were comparable across the groups (P = 0.988). The MAL test scores showed significant improvement on posttest (P = 0.00). Post hoc analysis revealed that the posttest score of AOU (P = 0.001) and quality of movement (QOM) (P = 0.000) are significantly higher than the pretest score both in BAT and conventional therapy group. Although there was no significant improvement in the amount of use in conventional occupational therapy group, there was a significant improvement in the quality of movement in this group (P = 0.001). This shows that conventional occupational therapy is effective in improving the movement quality of upper extremity in chronic stroke patients. The descriptive and inferential statistics are given in [Table 2]. Whitall J, McCombe Waller S, Silver KH, Macko RF. Repetitive bilateral arm training with rhythmic auditory cueing improves motor function in chronic hemiparetic stroke. Stroke 2000;31:2390-5. Bonifer NM, Anderson KM, Arciniegas DB. Constraint-induced movement therapy after stroke: Efficacy for patients with minimal upper-extremity motor ability. Arch Phys Med Rehabil 2005;86:1867-73. Radomski MV, Trombly Latham CA. Occupational Therapy for Physical Dysfunction. 6th ed. Baltimore, MD [etc. ]: Wolters Kluwer/Lippincott Williams & Wilkins, 2008. Taub E, Uswatte G, Pidikiti R. Constraint-induced movement therapy: A new family of techniques with broad application to physical rehabilitation – A clinical review. J Rehabil Res Dev 1999;36:237-51. Dobkin BH. Clinical practice. Rehabilitation after stroke. N Engl J Med 2005;352:1677-84. Luft AR, McCombe-Waller S, Whitall J, Forrester LW, Macko R, Sorkin JD, et al. Repetitive bilateral arm training and motor cortex activation in chronic stroke: A randomized controlled trial. JAMA 2004;292:1853-61. Fugl-Meyer AR, Jääskö L, Leyman I, Olsson S, Steglind S. The post-stroke hemiplegic patient 1. A method for evaluation of physical performance. Scand J Rehabil Med 1975;7:13-31.
van der Lee JH, Beckerman H, Lankhorst GJ, Bouter LM. The responsiveness of the action research arm test and the fugl-meyer assessment scale in chronic stroke patients. J Rehabil Med 2001;33:110-3.
van der Lee JH, Wagenaar RC, Lankhorst GJ, Vogelaar TW, Devillé WL, Bouter LM, et al. Forced use of the upper extremity in chronic stroke patients: Results from a single-blind randomized clinical trial. Stroke 1999;30:2369-75. Kelso JA, Putnam CA, Goodman D. On the space-time structure of human interlimb co-ordination. Q J Exp Psychol A 1983;35:347-75. Carr J, Shepherd R. Neurological Rehabilitation: Optimizing Motor Performance. Churchill Livingstone: Butter Worth-Heineman 1998. p. 241-64. Levine P, Page SJ. Modified constraint-induced therapy: A promising restorative outpatient therapy. Top Stroke Rehabil 2004;11:1-0.